Bulk Cable is not included in our free shipping promotion due to weight. Connect your Av Receiver to your loudspeakers for Superior Sound! These cost-effective performance cables give you maximum sound and wide dynamic range. The stranded oxygen-free copper wire lowers inductance and capacitance ensuring superior sound quality. 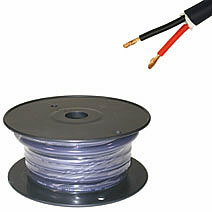 For low noise and distortion, each conductor is wrapped by polypropylene insulation. For price and performance, they are the perfect solution for connecting speakers to your receiver. Connect your hi-fi sound system with confidence in knowing that our Speaker Cable will deliver quality audio every time. 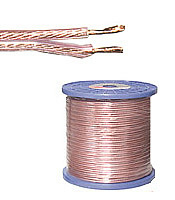 Featuring easy to connect 99.9% pure copper conductors, it is easy to handle and easy to install. These connectors are constructed with 24K gold plating that provides low-loss signal transfers and resists deterioration. The screw-on connectors can receive up to 12 AWG wire.